Chances are very good that if you have leather interior in your car, it’s probably in need of cleaning and conditioning. Most people realize this, but they simply don’t know what kind of products or processes are safe to use that will effectively clean their leather without potential damage. Before we go into details of what Leatherique Prestine Clean is and how to use it, let’s first take a look at Leatherique the company. Founded by George Pavlisko Sr. back in the 1960’s, Leatherique was developed first and foremost for actual leather restoration; not for commercial gain. In the process Leatherique was born and has continually been heralded as the finest leather restoration and preservation products available. To this day, Leatherique is still owned and managed by George Pavlisko, Jr. Leatherique products are widely used in many of the top personal and private automobile collections and museums around the world, as well as being used by many of the experts in the field of leather care and preservation. Most people just think of Prestine Clean as the second step of the deep cleaning and conditioning process when used with Leatherique Rejuvenator Oil. For more information on the complete 2-step process, please read my tutorial on how to use the Rejuvenator Oil and Prestine Clean system. What many people might not realize though is that Prestine Clean by itself is a very powerful (yet safe) and versatile all-in-one leather product, meaning that it cleans, conditions, and provides UV protection. 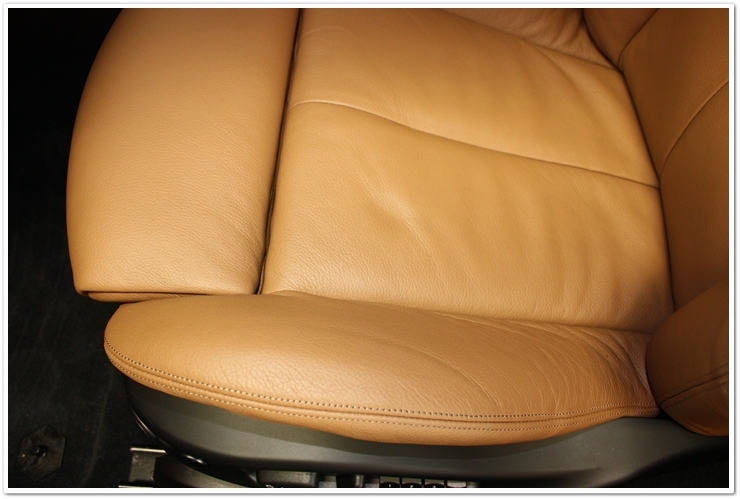 Prestine Clean was created so the leather could readily absorb it to maximize the cleaning and conditioning power. After the Prestine Clean soaks deep in to the leather the surfactants help safely separate contaminates from the leather and force them to the surface for removal. Once the process is complete, Prestine Clean will leave your leather with a clean, matte finish that is noticeably soft to the touch. Leatherique Prestine Clean (and Rejuvenator Oil) works equally well on older lacquer coated leather (pre-1990-ish), or newer water based coated leather upholstery. Prestine Clean is actually very simple to use. First of all I would recommend either putting it into a spray bottle, or attaching a trigger sprayer to the bottle of Prestine Clean…this just makes it simpler to use. For seats or other larger areas of leather like door panels or dash, just spray the Prestine Clean directly onto the surface. Once you have it coated, then massage the cleaner into the leather by hand making sure to get it into seams, cracks, and folds. For smaller areas, or places where you don’t want to get overspray, then you can either spray it first into your hands and then rub it into the leather, or spray it onto a soft cloth and work it in that way. I’ll usually allow it to dwell on the surfaces for 15-30 minutes, and then come back and clean/wipe down the leather with a damp towel. Keep a bucket of warm water nearby so that you can frequently rinse out your towel with all of the dirt and grime that it removes. You’ll be amazed at how dirty the water will get by the end of the application! After I wipe down the section with the damp towel, I’ll lightly buff it with a clean dry towel to restore the natural luster. If the leather is exceptionally dirty, then you’ll want to consider using the complete Leatherique system with a full application of Rejuvenator Oil as well. How Often Should I Use Prestine Clean? Unlike other leather conditioners on the market, Prestine Clean won’t build up on the surface so you can use it as often as you feel necessary. A good rule of thumb is to use Prestine Clean once per month for daily drivers to keep the finish clean, soft, and supple. I like to use the two-step, deep cleaning and conditioning of Rejuvenator Oil and Prestine Clean once or twice per year, and then perform a maintenance cleaning and conditioning with Prestine Clean once per month. Where Should I Use Prestine Clean? As I said before, Prestine Clean is a versatile all-in-one product…you can use it on leather, leatherette, vinyl, and rubber surfaces of your car. I like to use it on leather seating surfaces, vinyl trim, rubber door seals, rubber window trim, and it even looks great on tires, too. Not only will it keep these surfaces clean and looking nice, but by treating window and door seals in particular, it will keep them soft and flexible to prevent leaks and to keep wind noise at bay. If you drive a convertible where your interior is constantly being bombarded with contaminants and harmful UV rays, you definitely want to make Prestine Clean a part of your normal detailing routine. This BMW M6 only had 7000 miles on the odometer, but already you could see that the leather was in need of some serious cleaning and conditioning. Here I am applying the Prestine Clean and massaging into the surface of the leather by hand. After removal you can see that the leather now has its original soft, matte finish restored. 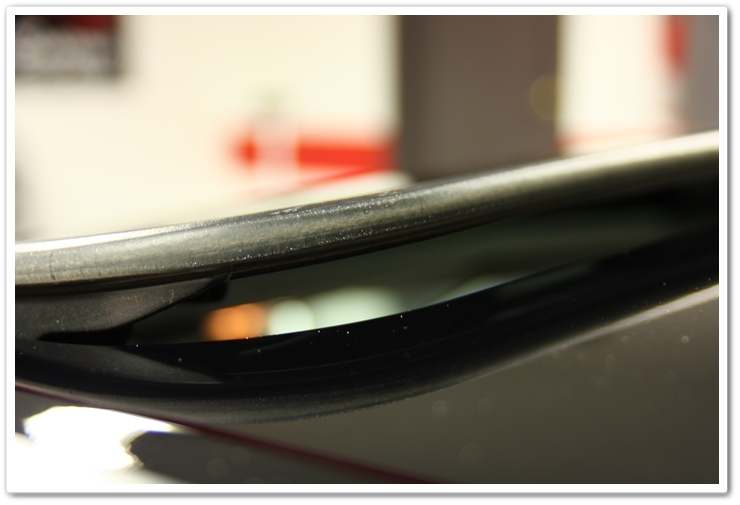 Here is a very critical area of your car to keep clean and conditioned…the seal around your sunroof! As you can see, it’s looking a bit needy as well. And don’t forget to treat your door and window seals to keep them flexible…this will help to keep down wind noise and to provide a better seal. If you have any additional questions or comments, or if you want to share the results you’ve had with Prestine Clean, please feel free to reply below. I bought Leatherique back in September 2009. I had gotten the Leatherique Prestine Clean – 16 oz, Leatherique Rejuvenator Oil – 16 oz, DI Accessories Adjustable Trigger, and the DI Microfiber All Purpose Towel – 16″ x 16″. I was just going to get the first two leatherique products, but after I saw your tutorial, I figured I should get the towel and the adjustable trigger too. I had not used the product yet and when I described a detail I did and that I intended to use my Leatherique, somebody on a forum gave me some feedback on why he felt leatherique is a poor product. Both Rejuvenator Oil and Prestine Clean are fantastic products, and my opinion is based off of my knowledge of leather, and the results that I continually get. Most of the arguments against the product are based on an assumption that the newer leathers are waterproof. This is not the case…they are water resistant. Ask anybody who has left their windows down in a rain, and a day or two later their leather is hard. I am not a hired pitch-man for Leatherique (or any other products). I use what I write about, and I write about what I use. And when I write about products like this and give them stellar reviews, it means that I have found them to be great products that work as well as or better than anything else out there. I base my findings off of proven results, not theory. Now jump in there and get your hands dirty, try the products out, and let us know what you think! Tried the rejuv oil and PC on a ’06 350Z…. Looks great and the protection is good I’m sure, but still is hard as cardboard. I did exactly as directed here and did 2 treatments. Maybe Nissan leather is garbage, I dunno. Thoughts? Brian, did you use just the pristine clean, or did you do a treatment of rejuvinator oil as well? Reason I ask is because I have found the rejuvinator oil to soften the leather far more than just the pristine clean alone. Now, for cardboard leather 2 treatments is better than 1, and 3 is better than two, but the dwell time. I noticed the article only mentions a dwell time of 15 mins or so. This is good for if you are trying to remove the rejuvinator oil or you are using prestine clean on new leather, but on older leather allowing each treatment to soak in for 24 hours in the heat if possible will yeild much better results (rejuvinator oil, I have not tried letting pristine clean on its own recondition the leather over 24 hours). I understand that this can almost make the car unusable as you can’t sit on the seat, but if you need to use the car you could cover the seat you need to use with cling wrap so you can still sit on it without getting covered in leatherique. 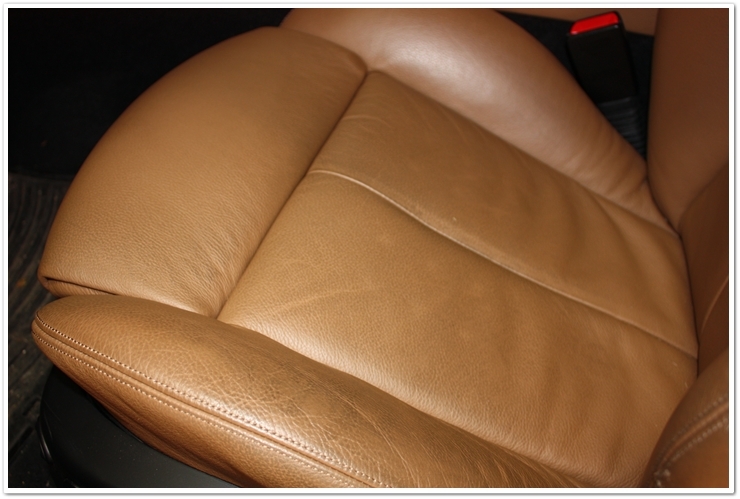 Since your car still has cardboard hard leather, I would recommend 2 or 3 treatments with the use of rejuvinator oil. Apply rejuvinator oil by hand, spreading liberally over the leather, then let dwell/ soak in for 24 hours (or if you can, 32 hours is great!) in the sun, or keeping the leather as warm as practical- applying more rejuvinator oil over the first few hours if you see it drying out. Then after atleast 24 hours, remove the rejuvinator oil (RO) using the pristine clean (PC) and a wet cloth, buffing dry with another dry cloth. If the results aren’t up to your expectations, repeat the above steps a couple of times. This should improve your leather quite a lot and from here you can just maintain it with PC, using the RO once or twice a year. Hope this helps, I know it took me a few trys before I figured what was the best method. Todd, thanks for the suggestions. I have used this system twice on different cars and each time i was amazed. Simply amazing products! Good deal Mo…glad to hear that you’ve been as successful with Leatherique as I have. I just did the two step process (RO & PC) over this past weekend and I was absolutely floored by the results! The transformation was so profound, I wish I had taken a ‘before’ picture. I’ll definitely be following Todd’s recommendation on using this product for monthly maintenance from here on out. Ah, music to my ears Mike! I’m glad it all worked out for you…now you just need to maintain it with the Prestine Clean and you’ll be good to go! Just bought 32 oz each of Rejuvenator Oil and Prestine Clean…we will be buying a “previously enjoyed” 😉 SUV (FX35 or MDX) shortly for my wife and even though both vehicles that we are considering seem to be relatively well cared for and clean, it never fails that the leather surfaces are in need of attention. I’m hoping that I can get the same results with the Leatherique products that you do…I’ll keep you posted. Thanks again for the concise and detailed reviews…keep ’em coming! I’m happy to hear that you’ve found my articles to be helpful. Just follow the instructions that I have provided for using the kit, and I’m sure you too will achieve stellar results. Let us know how it goes. There’s only so much you can do to improve “pleather”. Having said that though, I would still highly recommend using PC on it while you’re doing the rest of the real leather interior. I am a big fan of the Leatherique System and never hesitate to sing its praises to my clients. I use it on my own cars as well as my friend’s and family’s. I’m glad to hear that you’re as big of a fan of the Leatherique products as I am! Todd, when you use the Pristine Clean on window and door seals, do you rinse those with a damp cloth too? Or do you just apply it and leave it? On those areas, I just apply it and leave it. Thanks Todd. I gave Pristine Clean a try after reading your review on it, and was pleasantly surprised how effective it was. It was also easy to use as well. I just ordered a bottle of Rejuvenator Oil, thinking it will do wonders for some leather that is a little more worn. Looks like a great product. Thanks for the advise. Can this product be used on suede? If not what product do you recommend. Thanks Ross, and yes…it’s a great product. No, you wouldn’t want to use it on suede. I don’t run into too much of it, but when I do I typically just use compressed air, a light brush, and / or a damp soft cloth to clean it. I have ben using leatherique products for over 5 years. They are great, I used in my RR corniche II that has some creases, and I removed all of them, leaving the leather soft and clean and the creases removed!! I have use the water base for bumpers and my Mercedes 350 look great, before was lost in a Fire. One time the RR people gave a cream that created a problem, and was greasy and I have to removed using rejuvenator for a long time, that mean several applications. Good Luck to all of you, If you want some photos I will send them to you. I have a 1988 Testarossa that had seen it’s share of leather treatments and some re-coloring. I took the interior out and took the seats apparat to clean and re-color them using Leatherique’s systems. Seats, headliner, A pillar, dash, door panels, everything, also re-colored the carpets. It took some blind faith to clean off the old color with laquer thinner, per Leatheriques instructions. I let the oil soak for three days before I started the cleaning and re-coloring. I used the spray gun method. The interior looks like new! A question though, I do not understand how the Leatherique oil can penetrate the color to feed the leather? Any idea? Thanks Mike, and I’m glad to hear that you’ve also had great results with the Leatherique products like so many other enthusiasts and professional detailers have. Whether you’re talking about the dye you re-applied to the seats, or the original seats themselves…the outer part is water-resistant, not waterproof! Given this, the Leatherique conditioners will penetrate the surface to deep condition the fibers of the leather. Anybody who has left their windows open in the rain will attest to this because their water-soaked leather dried and became hard afterwards. I have a 1996 Volvo 850R. In case you aren’t familiar with these cars, the seats have Alcantara suede running up the middle, with leather around the outside. I plan on using the leatherique on the leather to treat it, but have some concerns about the suede. Do I need to worry about keeping the product off of the suede? How “runny” is the product? If I put it on the leather, will it run towards the suede, or should it stay put? The Rejuvenator Oil is thicker than Prestine Clean. For either products, I’d recommend using some kind of microfiber or terry cloth applicator pad to apply a thin, even coat next to the suede. If you squeeze out most of the product from the applicator, you should be able to keep it to just a light application. While it shouldn’t hurt the suede if a little got on it, you still want to avoid it if possible. Great show Todd! Your analogy about the fmarer vs. the hunter is a great way to bring your point across about face to face networking. How true it is sometimes we forget the importance of cultivating our relationships thanks for the reminder. Looking forward to your next show! How long does the smaller bottle last? I am going to do the driver and passenger seats and am wondering how many times I can clean both seats. Thanks for the review, Todd! My Leatherique will be here in a few days and I would like to use it on my vehicles ASAP. I must ask, how should I go about using the rejuvenator oil in the winter (I live in Michigan)? I do have a heated garage but that won’t give me a “hot summer day in the sun with the windows up” amount of heat. Recommendations? Space heater? I use Leatherique all the time during the winter in a climate controlled garage that’s only around 70 degrees. The key then is to just give it ample time. Let it dwell on the leather for about 24 hours, and you should be good to go. I have an MB with perforated leather. What, if anything, do you do differently when using Prestine Clean (or rejuvinator oil) on perforated leather? You don’t need to do anything different when dealing with perforated leather. It may take a little more time to fully dry if you use a lot of product, but that’s really the only difference. If you’re dealing with heavily soiled perforated leather, it may take some extra time, but that’s all. Excellent detailed review. I have a brand new BMW with ventilated seats. 1. Can I skip the RO, since the car is brand new, always garaged and meticulously cared for? 2. Do I need to exercise any caution when using this product, due to seat fans? I typically do the full treatment even on brand new vehicles, but it’s not a must. I have also worked on ventilated seats with no issues. I have just received a bottle of each. It was on sale for $40 for the 2 bottles. I used it on my Porsche Boxster first. The leather is a gold or mustard color. It looks great. Seeing it is my daily driver and no one sits in the passenger seat, it was a good test. The driver’s seat looks just as good as new. then used it on each of my 2 Ferrari’s. Black in one, tan in the other. Just beautiful. The door panels, which are also leather, look better than new. Accumulated dirt is gone. The leather dash is clean with just a hint of luster. Everything looks, feels and smells new. I am so impressed that, for a change, something works as advertised. Any tips or advice for incorporating a leather brush into this process? You could apply Prestine Clean, let it dwell for a few minutes, lightly brush with a leather brush, then proceed with the removal process. I have a 63 Buick Riviera with original leather in good shape. I have been using Wolfgang Conditioner for 4 years and it seems that the black dye is fading (car is never left outside and I do 4-500 miles per year)- I’m wondering if the conditioner is doing this. I am thinking of trying Leatherique oil but am concerned that that the Prestine Clean will remove more of the dye. I am not sure what type of leather was used in 1963 GM products. With older cars, it’s hard to say what they have gone through over the years. In many cases they have been re-dyed at some point, and through cleaning and conditioning these dyes (especially when not done properly) can come off. So if in the cleaning and conditioning process you remove dye, then it’s typically the result of the dye that was used, and not a problem with the conditioner. If you’re having a problem with fading and dye coming off, then perhaps what you should consider is a thorough conditioning with the Leatherique system, and then having the seats professionally re-dyed. I just tried the Leatherique two step system on my 91 NSX and my dads 08′ C6 and it left both cars with a “tacky” surface on the seats. I was just wondering if I did something wrong or what I should try next?? Thanks so much for your advice. Did you follow the instruction in the Leatherique How-To article? Usually the leather has a tacky feeling after using Rejuvenator Oil (the first step), but that’s cleaned up after using Prestine Clean. So it sounds like either you didn’t finish off the Prestine Clean process properly, or you used them in the wrong order. Re-do your Prestine Clean process, and that should take care of the problem. I have a brand new 2011 Hyundai Genesis sedan with all leather and I would like to know if it is necessary to use the RO on new leather surfaces. Thanks for all the great information and the tutorials. While it’s not necessary, it is helpful for the long term condition of the seats. Todd, great article as usual. You mention Prestine clean provides UV protection. Is that enough protection by itself applying once a month or would you couple this with other products? Also, would you use this on a leather wrapped steering wheel? If not, what product would be used for cleaning/protecting the steering wheel? On one of my cars the dye all of a sudden is starting to rub off around the 12 oclock position just by mildly rubbing with damp towel (water or Meguires QID). This is only a four year old car well maitained so not sure why that is happening but would like to find a product or treatment to deal with it. Thanks. I would use it by itself…not with another product. 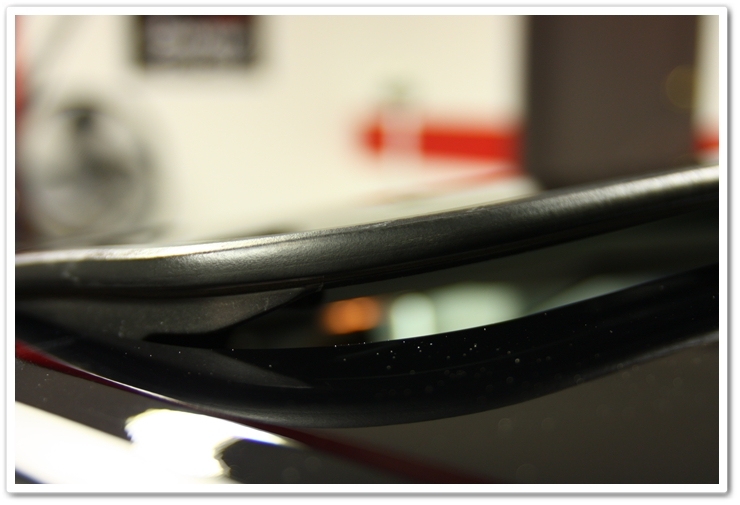 This is perfect for regular maintenance and UV protection. You can use it on your steering wheel as well. Thanks. SO for the steering wheel, it doesn’t leave it feeling more slick? Could you use 303 for leather steering wheel? No, it does not. Leatherique Prestine Clean will leave a clean, matte finish whereas something like 303 will leave a “dressed” look to it. Todd, I have a 60 year old car with the original interior in it. It is cracked and dried out. I am trying to keep the car ALL original and would like to see if I can restore the leather. Do you think the RO & PC clean will be able to bring the leather back on something this old? It sounds more like you’re working with an issue of preservation as opposed to restoration at this point. I did the same with a 40+ year old, 7-figure Ferrari where the seats were in very poor condition. Our goal was to re-introduce some much needed conditioning to keep it from deteriorating even more. What you’ll want to do is give the leather a full treatment of RO, then come back and re-apply more of it 3 or 4 hours later in the areas where you see it has soaked in. Then after 24 hours carefully finish it all off with PC. In a couple of weeks, do another full treatment. After that I would put it on a schedule of once or twice per year. simply the best product i have every used. Is this product also good to restoring the window outside rubber trim? I had paint residue on mine, and used a magic eraser to clean it up, and the result is a ugly looking trim all around the car. Will this dye the rubber and stay in for a long time? How do I apply, do I use the cleaner first? If I understand the instructions correctly for using Prestine Clean, the leather is to be wiped with a damp cloth after the application, and then buffed with a dry cloth…correct? So if the product is being applied to other surfaces (e.g. vinyl, pleather, rubber, etc) do they also need to be wiped with a damp cloth after the application? 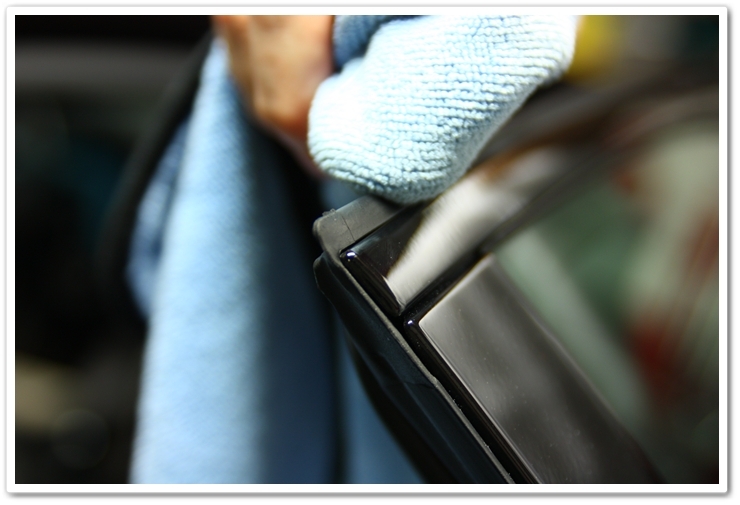 Or can those surfaces be treated and not wiped with a damp cloth, as with most other dash treatments? I have the same question. Can I use the PC on other parts of the car such as the dash and rubber sections, and NOT wipe it off with a damp cloth, as done for the seats after using the RO. And if I can leave it on the other parts of the car during monthly use without the RO can I leave the PC on the seats without wiping, since there is no RO to clean off? By the way my audi A5 black on black looks fantastic….and it’s new , love the products! In regards to this products cleaning abilities, I understand that a diluted APC like OPC or Meguairs are very popular for cleaning extremely dirty leather seats. Do you think that this product is comparable if not better than diluted APC in regards to cleaning extremely dirty leather seats? digg іt and personally sᥙggest tоo my friends. Ⅰ’m ѕure tһey wiⅼl be benefited fгom thiѕ site.